Raise Awareness for Alzheimer's with Vinyl Banners! According to the Alzheimer's Association, Alzheimer's is the 6th cause of death in the United States. There are lots of different ways that you can raise awareness for Alzheimer's Disease using vinyl banners. Some of the most common events include 5K Walks and fundraisers. If you are having a walk or run to raise awareness, be sure to advertise with vinyl banners. You can display the vinyl banners before the event to let people know when the event is, how to register, and any additional information. On the day of the event, you can use vinyl banners to let people know where the start line, finish line, registration booth, restrooms, and other booths are located. Fundraisers are a great way to raise money and awareness for Alzheimer's Disease. If you are having a fundraiser, you can display the event information on vinyl banners and display the banners before and during the event. 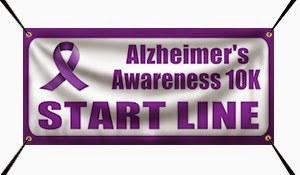 If you are ready to get started on your Alzheimer's banners, you can go to our vinyl banners page. You can create a template in the online designer, upload a file, or have one of our graphic designers create a design for you. There are at least 44 million people living with Alzheimer's and other dementias. Everyone who has a brain is at risk to develop Alzheimer's—but everyone can help to fight it.